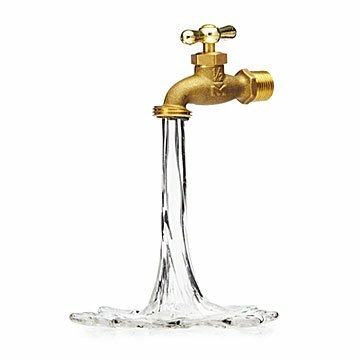 This glass and brass faucet sculpture is sure to quench that thirst for art. Have that one room in your house that's thirsty for style? This glass and metal faucet will inspire double-takes with its lifelike flowing glass "water.” The piece was created by Gary Guydosh while training as a glassblower at Bowling Green State University. Over the next 19 years, he refined the design and created thousands of these sculptures in his Pittsburgh studio. Now, Glassblower Luke Adams and his team carry on the legacy of this unique design. Using a traditional solid-glass shaping technique and special steel tools, he forms the molten glass into a free-flowing water shape, and finishes the piece with a brass faucet. Handmade in Norwood, Massachusetts. The Glass Water Faucet was originally conceived by Gary Guydosh during his formal glassblowing training at Bowling Green State University. Over the next 19 years, Gary refined the design and created thousands of these sculptures in his studio in Pittsburgh, Pennsylvania. He was fortunate also to have studied with the Italian glass masters in Murano, Italy. Gary's untimely passing would have deprived the world of his creation, but UncommonGoods has worked to preserve his technique and legacy. Though it is a different artist, the Glass Water Faucet still embodies Gary's design. Gary has said "Making the glass come to life is no easy task, but all of the difficulties vanish before the pleasure and emotion I feel when fire, which softens and moves forms, lets me reach the ideal dimension." My friends loved this piece as a wedding gift! I was able to give it to them as a reminder of the ongoing flow of love that is living water to a marriage. They placed it in an area that gets natural sunlight and told me that it reflects the sun in a beautiful way. I am sure that I will be ordering it again as a gift. I may need to order one for myself as well. Love it. I bought for my master plumber. Brings a smile to everyone who looks at it. A visual treat, especially when displayed "out of nowhere," e.g., not trying to appear attached to a wall or another object. If you're looking for something unusual that will be a source of amused enjoyment, you've found it. I have it butted up to my wine barrel. It looks really cute! A fun gift for a recently licensed plumber. I thought this was amusing when I saw it and added it to my bookshelves. It looks very realâ€”grandchildren wanted to try turning it off. I have it on display in between plants in front of a window filled with some of the stained glass pieces I have made. The window is at the front of the house, in the kitchen. I myself look for " Uncommon" pieces to decorate with. I appreciate the work artists put into their craft.